Just before school starts, seven-year-old Billy Miller falls while he is on vacation with his family, giving himself a big lump on the head. Billy worries that now that he bumped his head, he might not be smart enough for second grade. 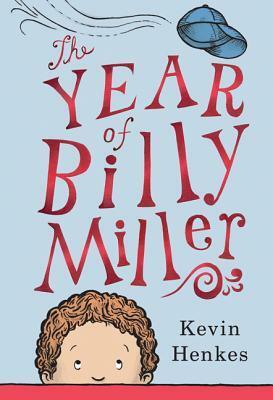 As the year wears on, however, Billy proves himself more than capable, as he wins over his new teacher, helps his father reach a breakthrough with his art, attempts to stay up all night with his little sister, Sal, and writes and performs a poem celebrating his mom. I have long admired Kevin Henkes for his range as an author. He writes successfully for all levels, from babies and toddlers right up to middle schoolers. I enjoy sharing his simple picture books like A Good Day and Birds in lap time and story time. Chrysanthemum is a favorite for school visits. His Penny books have been popular in my beginning reader story times, and they often disappear from the shelves the moment they are put back. Novels such as Words of Stone and Olive's Ocean demonstrate his deep understanding of the emotions of childhood and his mastery of the English language. The Year of Billy Miller combines all the best of Henkes's talents into what I believe is his best work to date. The appeal of Billy Miller is that he is just a normal kid, living his normal day to day life. He doesn't have super powers. He's not a child prodigy, a kid detective, or even a troublemaker. He's a typical seven-year-old whose biggest problems involve getting off on the wrong foot with his teacher and wondering if it's babyish to call his parents "Mama" and "Papa." Each of the four sections of the book - called simply Teacher, Father, Sister, and Mother - explore events that take place either at home or at school, meaning that most of what happens to Billy could happen to any child of his age. Billy is a character whose universal experiences give him universal appeal, but at the same time, he is a very specific boy brought to life with very specific details. There are so many lovely moments in this book that make Billy a memorable and sympathetic character. I love the scene where he picks up two red markers to use as devil horns to make a face at an annoying classmate and realizes too late that his teacher thinks he is making fun of the chopsticks in her hair. I love that he sits his parents down at one point to explain that he wants to start calling them "Mom" and "Dad" instead of "Mama" and "Papa" and that he finds that he must practice their new names to remember to use them. I also enjoy the fact that he uses the phrase "food baby" and that he makes up a new friend to play with his sister's stuffed whales when he tries to get her to stay up all night with him. The Year of Billy Miller combines the precision of language of Henkes's novels with the emotional intelligence and character education of his picture books. Though it's not quite an early chapter book, as it is quite long and is not necessarily an easy read, it will appeal to kids in preschool and early elementary school, and it will be an ideal read-aloud for families and primary classrooms. This book is my favorite of this entire year, and I hope I'm not alone in thinking it might receive some Newbery recognition this Winter. The Year of Billy Miller is a must-buy for libraries, and a must-own for families who love distinctive and timeless children's books. For a wonderful review of this book and a deeper explanation of why it's so great, read Betsy Bird's review over at Fuse 8.